Kazutomi was born on January 3rd in Hyogo Prefecture. In 2009, he debuted in Seitokai no Ichizon as Yoshiki Nakameguro, and has appeared in many other series since then. 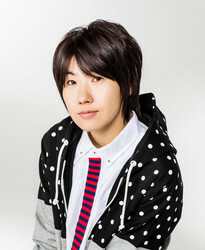 In 2012, he voiced Kio Asuno in Mobile Suit Gundamn AGE as his first leading role. In 2013, he won the Best Rookie Actor at the 7th Seiyu Awards In 2015, he played protagonist Yumoto Hakone in Cute High Earth Defense Club LOVE!. For the same series, he performed the opening theme song as part of the unit Earth Defense Club, and participated in Earth Defense Club's first live event Cute High Earth Defense Club LOVE! LIVE! (at Zepp Tokyo) on May 23, 2015. His main roles include: Cute High Earth Defense Club LOVE! as Yumoto Hakone, Mobile Suit Gundam AGE as Kio Asuno,Future Card Buddyfight as Tetsuya Kurodake, and Yurikuma Arashi as Life Beauty.